Comparing corn oil to canola oil and soybean oil will give you an idea of how vegetable oil is different than corn oil. Although vegetable oil can mean any oil that comes from a plant, it usually refers to soybean oil, canola oil or a mix of oils. This type of oil can also include corn oil or oil from sunflower seeds. Read the ingredients label to determine exactly what type or types of oil are in your favorite brand of vegetable oil. Choose canola-based vegetable oils to get the most health benefits because they contain the most cholesterol-lowering monounsaturated fat, with 62 percent, and the least artery-clogging saturated fat, with 7 percent. Both corn oil and soybean oil contain the same 25 percent monounsaturated fat, but soybean oil has more saturated fat, with 15 percent compared to the 13 percent in corn oil, making corn oil the second best choice. Although all vegetable oils are similar in fat and calorie content, their vitamin content differs. Soybean oil provides the most vitamins, with 6 percent of the daily value for vitamin E and 32 percent of the DV for vitamin K in each tablespoon. Canola oil is next highest in vitamins, with each tablespoon providing 12 percent of the DV for vitamins E and K. The same amount of corn oil has 10 percent of the DV for vitamin E but no vitamin K. You need vitamin K for blood clotting, and vitamin E acts as an antioxidant to limit damage to your cells from compounds called free radicals. People in the United States often have very high omega-6 to omega-3 fat ratios, which may increase your risk for inflammation and heart disease. Both soybean and corn oils are high in omega-6 fats, making canola oil a potentially healthier choice. If you're trying to avoid foods containing genetically modified ingredients, you're better off with olive oil because vegetable oil, canola oil, corn oil and soybean oil are usually made with genetically modified ingredients in the United States. Cooking oils at too high of a temperature causes harmful fumes and the production of free radicals, which can damage your cells. You need oils with a high smoke point if you're cooking at high temperatures. 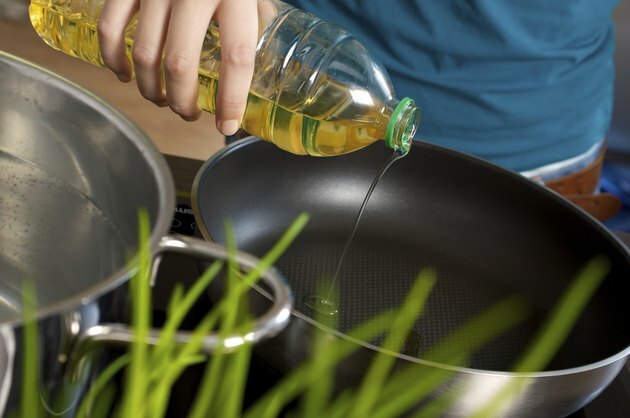 Oils sold as vegetable oil tend to be more highly refined, and as such have a higher smoke point than less refined oils, making them suitable for baking, frying, sauteing and marinating. Canola oil has a medium-high smoke point, so you can use it in similar ways to vegetable oil, but don't turn the heat past medium. Corn and soybean oil have medium smoke points, and are better for sauces, low-heat baking and light sauteing due to their lower smoke points.